Guess what drops in Singapore today? 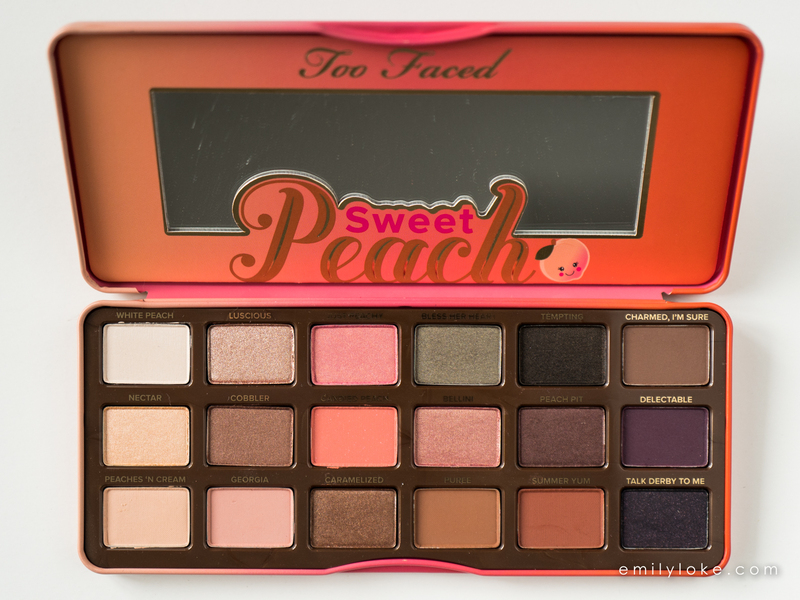 I’m super excited about this, because out of all the Too Faced palettes out there, the Sweet Peach Palette is the one I have been – ahem – stalking the longest. The colours just really speak to me. And I mean, ALL of them do. Right off the bat, I could tell that I’d actually use every single colour in there, which is pretty unusual (for me at least). Up to this point, the closest I’ve ever gotten to that was the original Urban Decay Naked palette…and even then I’ve almost never touched Creep and Gunmetal. Out of the 18 shades, about 2/3 of them are warm with the other 1/3 being more neutral than actually cool. This is truly the ideal ratio of shades for me personally, but the colours on a whole are so beautiful that I’m not at all surprised at how popular this palette is. It’s worth noting that 7 out of the 18 shades are a balanced mix of matte base, transition and crease colours, which speaks to how well this was designed as an all-in-one palette. You can really do it all with just this. The rest of the shades are a mix of frosts, metallics and glitters. The eyeshadows in this photo appear quite true to life, save for Candied Peach which has a light smattering of fine fuchsia glitter that sadly didn’t show up well in pan photos or swatches. 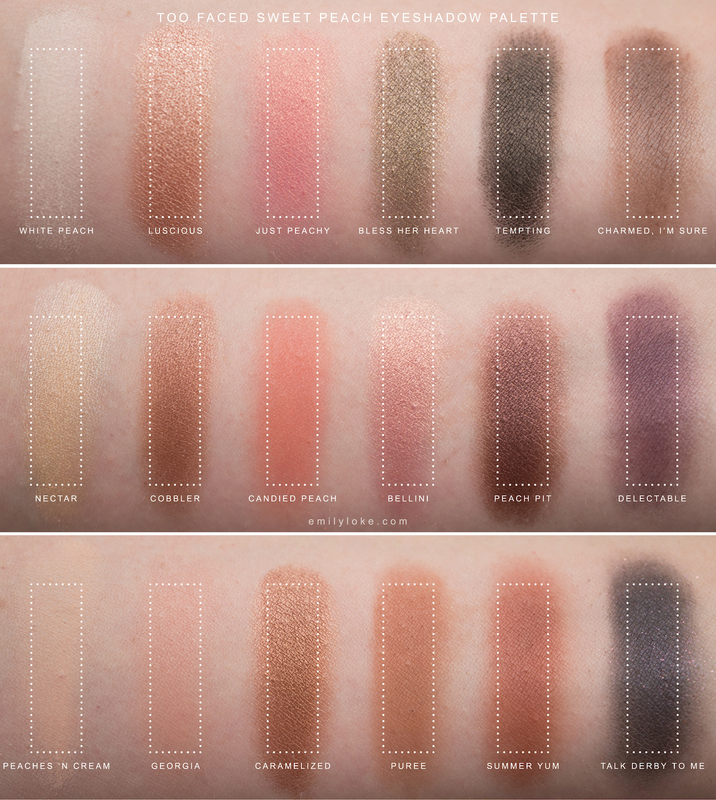 The texture of these shadows is on the dry side, though they are all very even, pigmented and smooth – even the mattes. The only colours I had trouble with were Candied Peach and to a lesser extent, Talk Derby To Me. The dryness of the shadow base meant that the glitter kind of went everywhere when I was swatching, but in all fairness I didn’t swatch over primer and I’m pretty sure they’ll adhere a lot better to primed lids than a dry arm. The shades that had the best texture were the metallics. Peach Pit, Luscious and Caramelized are so, so beautiful and rich I’m having a hard time picking my favourite from the bunch. Actually no, I take that back. Peach Pit is my favourite. 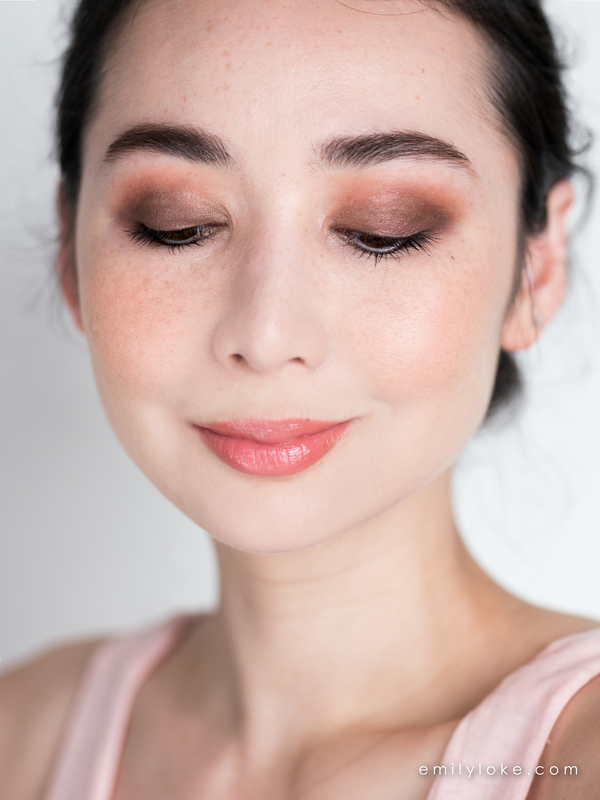 I’m just a huge sucker for coppery plum shadows (of which there are few in the world) and this is a truly gorgeous iteration of it. If you need one good reason to buy this palette, buy it for this shade. I just realized I’ve gotten quite far along in my review without addressing the scent! 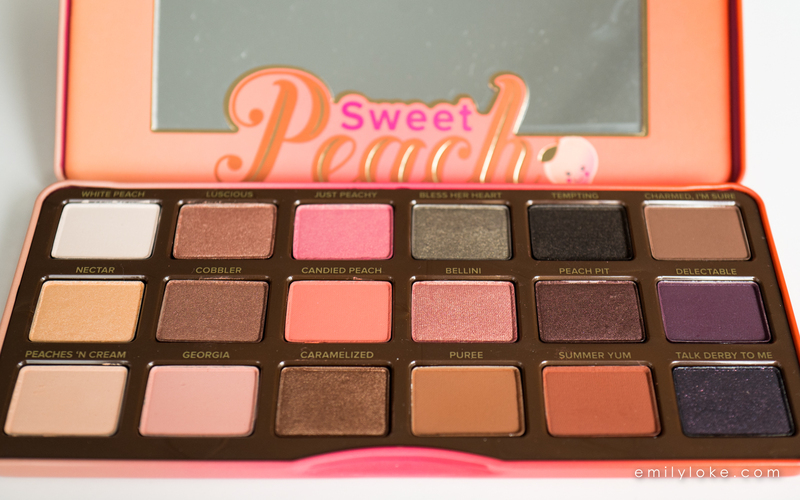 Yes, this whole palette smells like peaches and the fragrance will waft up every time you open the case. You can leave it open in a cool, dry place for a few days to lighten the scent if you wish, but I personally really like the smell of peaches so I don’t plan on doing this. By the way, the scent doesn’t seem to transfer to my face, so you don’t have to worry about smelling like peaches all day. 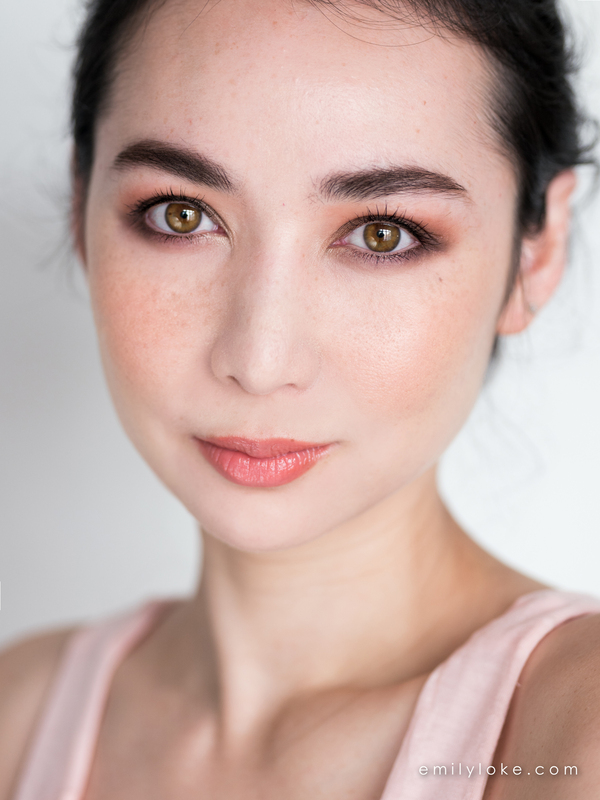 Here’s a look I created with – you guessed it – Peach Pit as my starting point. It’s what I used all over my mobile lid, with a bit of Cobbler as well. I’m also wearing Summer Yum in my crease, with touches of Nectar in the inner corners and Talk Derby To Me in the outer V.
As for the rest of my face, I used the Sweet Peach Glow bronzer/blush/highlighter trio on my cheeks and finished up with Sweet Peach Creamy Lip Oil in Peach Tease on my lips. For all the hype this palette gets, it seems fitting that I should end this post with a “…but do I NEED it?” Personally, I’d have to say yes. This palette has all the warm colours I’ve been gravitating towards lately, plus some complimentary neutral shades that keep it from being too one-note. The shade/texture mix has been well designed for convenience and ease of use, and owing to its sturdy metal case, I’m also more inclined to take this traveling with me. 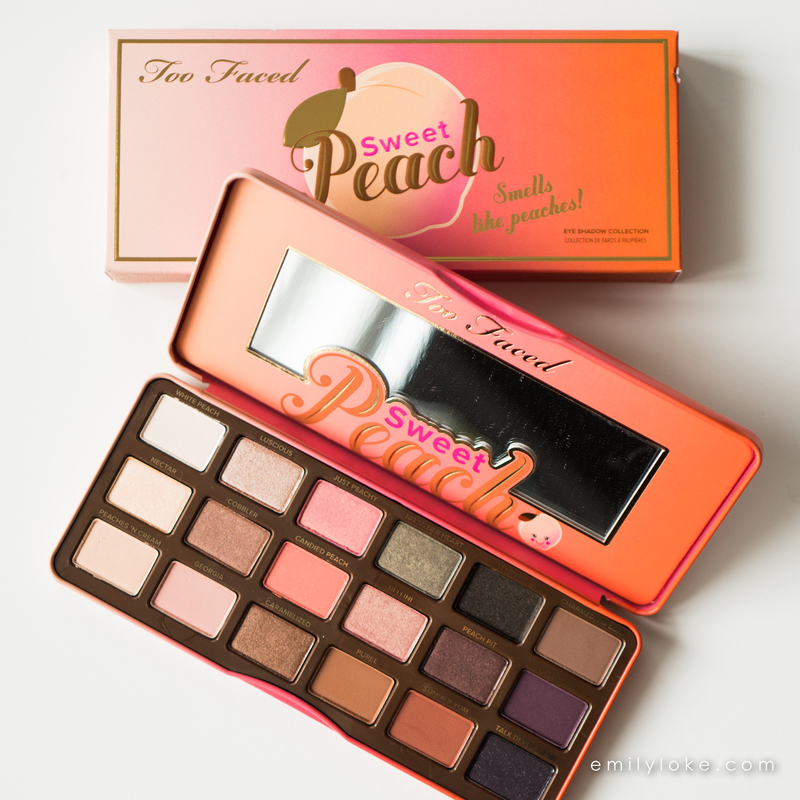 Pricing and Availability: Too Faced Sweet Peach Palette (SGD$76) is part of Too Faced’s permanent collection and is available in store at Sephora Singapore from February 2nd onwards. 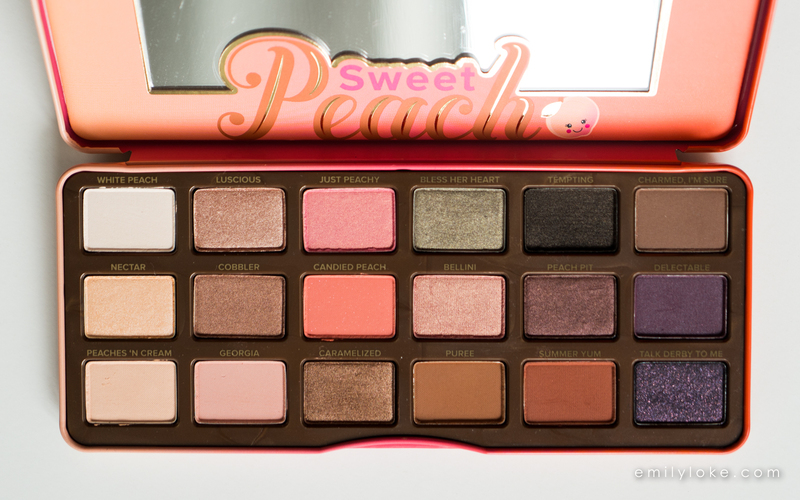 I didn’t think much of this palette because it’s so hyped up, and I didn’t bother looking for the swatches. You’ve made me change my mind! I’m easily swayed. Have to go to Sephora to take a whiff of this palette!